I was awoken to the sound of gushing water, it sounded like a geyser spraying out onto the road. My instincts kicked in, and I got out of bed and rushed to the window to see if I could identify the problem. I had heard this sound before at home, a broken sprinkler, but I was staying in someone else’s home. I got to the window and looked out, just as I suspected, a sprinkler head had broken off and was gushing out a geyser of water high into the air. As I looked out and considered my options my logical brain awoke to meet up with my crisis brain. The mental conference call began. I considered my options. As I assessed the situation I remembered that I was staying at my sister’s house and the sprinkler was on community property. There was no easy valve I could shut off. It wasn’t ‘my water’, it wasn’t even my sisters water. There was a home owners association to handle such a thing. In the middle of the night they wouldn’t even care. Nor did I have a way to reach them. I also reasoned that no one was being hurt by the geyser and that it could wait till morning. So really there was nothing I could do about it at the present moment. So I went back to bed. A few moments later I was fast asleep as the soothing sound of water splashing on pavement soothed my nerves and sent me off to dream land. The remarkable thing about this story, to my mind, was my reaction of allowing it to not stress me. If it had been at my house, with my sprinkler I would have gone into a panic and rallied the troops (my dogs) we would have gone out and further assessed the situation. Gotten frustrated with the broken sprinkler, found a way to disable it, possibly have gone as far as fixing it (at 3am) and then spent the rest of the night agitated that I couldn’t sleep because I was so keyed up on adrenaline. This to me was notable because in both cases it would have been mostly the same situation, but my perception of control and ownership would have caused me to escalate to a whole new level of alarm. My ability to handle the physical situation would have caused me to lose control of my mental situation. I can say this because I’ve been through it enough in the last few years to realize how I would have reacted, had I perceived the situation as “mine”. Perhaps my stress reaction is just part of the burden of ownership. It appears that I can handle situations just as well, if not better, if I perceive myself as being the assistant or an extra, instead of being the lead character. Allowing myself to become a supporting actor instead of the star of the show could actually enable me to live a more relaxed and burden free life. Perhaps it will aid in my efforts not to be a control freak in other areas of my life… Well, maybe. I read Hitchhiker’s Guide To the Galaxy, when I was in high school. One of my favorite parts was the S.E.P. field. 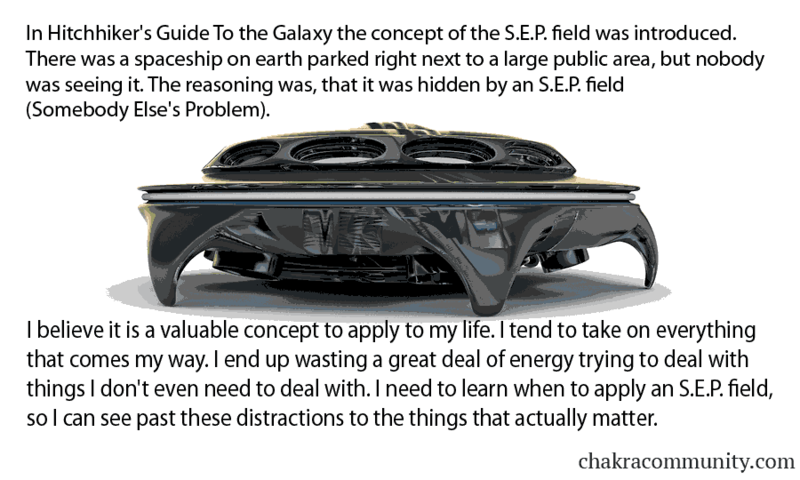 There was a spaceship on earth parked right next to a large public area, but nobody was seeing it. The reasoning was, that it was hidden by an S.E.P. field (Somebody Else’s Problem). This distortion field caused the viewer to not see the ship when looking at it directly. You had to view it out of the corner of your eye. If you caught a glimpse and then tried to look at it directly it would simply disappear again. I believe it is a valuable concept to apply to my life. I tend to take on everything that comes my way. I end up wasting a great deal of energy trying to deal with things I don’t even need to deal with. I need to learn when to apply an S.E.P. field, so I can see past these distractions to the things that actually matter. Now, to learn the skill about when it’s appropriate to apply these fields and when to keep paying attention. I guess that’s a lesson for another time. Remember, don’t sweat the small stuff!